As the carbon content rises, steel has the ability to become harder and stronger through heat treating, but this also makes it less ductile. Regardless of the heat treatment, higher carbon content reduces weldability. In carbon steels, the higher carbon content lowers the melting point. Carbon Steel is used in the most critical engineering applications and also in certain applications in the automotive sector. In addition, some of the value-added Carbon Steel products include steel for LPG cylinders, API grade, corrosion resistant steel, critical structural application steel, boiler quality, auto grades, precision tubes and medium/high carbon grades, among others. Specification for line pipe API SPEC 5L (-09): specifies the requirements for the manufacture of two product specification levels (PSL1 and PSL2) of seamless and welded steel pipes for use in pipeline transportation systems in the petroleum and natural gas industries. Non-Schedules : .120wall, .156wall, .188wall, .203 wall, .219wall etc. NACE MR0175, NACE TM0177, NACE TM0284, HIC TEST, SSC TEST, H2 SERVICE, IBR, etc. All Pipe is manufactured and inspected/tested to the relevant standards including ASTM, ASME, API. API 5L X42 PSL1 Carbon Steel Seamless Pipe Carbon Steel Seamless Pipe Packing API 5L X42 PSL1 Carbon Steel Seamless Pipe Carbon Steel Seamless Pipe is sleeved into plastic bag individually, pieces wrapped with water-proof material, bundled with nylon rope. Clear labels are tagged on the outside of the package for easy identification of the quantity and product I.D. Great care is taken during operation and transportation. 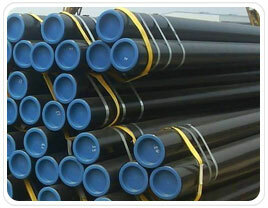 API 5L X42 PSL1 Carbon Steel Seamless Pipe Carbon Steel Seamless Pipe packing will be according to international standard in bundles strapped by strips then into containers to avoid any damage. – Each bundle covered with plastic for protection against extreme weather. – End of API 5L X42 PSL1 Carbon Steel Seamless Pipe Carbon Steel Seamless Pipe protected by plastic caps. – Bundles strapped with plastic strips. – Each radius of U-Bend tube separated by a separator. – Packaging list (laminated) placed with box/crate. We export API 5L X42 PSL1 Carbon Steel Seamless Pipe Carbon Steel Seamless Pipe to Iran, Iraq, Oman, Qatar, Albania, Muscat, Bahrain, Turkey, Egypt, Maldives, Italy, UAE, Bahrain, Indonesia, Australia, Kuwait, Saudi Arabia, South Africa, Germany, UK, Denmark, Canada, USA, Peru, Brazil, Nizeria, Mexico, Venezuela (Latin America), South America, Russia, kazakhstan etc. Steber Steel is a well known worldwide exporter of API 5L X42 PSL1 Carbon Steel Seamless Pipe Carbon Steel Seamless Pipe ,Steber Steel is committed to provide each and every customer with the highest standard of customer service. We deals in API 5L X42 PSL1 Carbon Steel Seamless Pipe Carbon Steel Seamless Pipe in India & Overseas, offering a wide range of API 5L X42 PSL1 Carbon Steel Seamless Pipe Carbon Steel Seamless Pipe. Select Category ASTM A312 / A312M STAINLESS STEEL PIPE 304 GR. ASTM A312 / A312M STAINLESS STEEL SEAMLESS PIPE 304 GR. ASTM A312 / A312M STAINLESS STEEL ERW PIPE 304 GR. ASTM A312 / A312M STAINLESS STEEL PIPE 304L GR. ASTM A312 / A312M STAINLESS STEEL SEAMLESS PIPE 304L GR. ASTM A312 / A312M STAINLESS STEEL ERW PIPE 304H GR ASTM A312 / A312M STAINLESS STEEL PIPE 304H GR. ASTM A312 / A312M STAINLESS STEEL SEAMLESS PIPE 304H GR. ASTM A312 / A312M STAINLESS STEEL ERW PIPE 304H GR. ASTM A312 / A312M STAINLESS STEEL PIPE 316 GR. ASTM A312 / A312M STAINLESS STEEL SEAMLESS PIPE 316 GR. ASTM A312 / A312M STAINLESS STEEL ERW PIPE 316 GR. ASTM A312 / A312M STAINLESS STEEL PIPE 316L GR. ASTM A312 / A312M STAINLESS STEEL SEAMLESS PIPE 316L GR. ASTM A312 / A312M STAINLESS STEEL ERW PIPE 316L GR. ASTM A312 / A312M STAINLESS STEEL PIPE 904L GR. ASTM A312 / A312M STAINLESS STEEL SEAMLESS PIPE 904L GR. ASTM A312 / A312M STAINLESS STEEL ERW PIPE 904L GR. ASTM A312 / A312M STAINLESS STEEL PIPE 310 GR. ASTM A312 / A312M STAINLESS STEEL SEAMLESS PIPE 310 GR. ASTM A312 / A312M STAINLESS STEEL ERW PIPE 310 GR. ASTM A312 / A312M STAINLESS STEEL PIPE 321 GR. ASTM A312 / A312M STAINLESS STEEL SEAMLESS PIPE 321 GR. ASTM A312 / A312M STAINLESS STEEL ERW PIPE 321 GR. ASTM A312 / A312M STAINLESS STEEL PIPE 347 GR. ASTM A312 / A312M STAINLESS STEEL SEAMLESS PIPE 347 GR. ASTM A312 / A312M STAINLESS STEEL ERW PIPE 347 GR. ASTM A312 / A312M STAINLESS STEEL PIPE 347H GR. ASTM A312 / A312M STAINLESS STEEL SEAMLESS PIPE 347H GR. ASTM A312 / A312M STAINLESS STEEL ERW PIPE 347H GR. Select Category ASTM A312 / A312M STAINLESS STEEL TUBE 304 GR. ASTM A312 / A312M STAINLESS STEEL SEAMLESS TUBE 304 GR. ASTM A312 / A312M STAINLESS STEEL ERW TUBE 304 GR. ASTM A312 / A312M STAINLESS STEEL TUBE 304L GR. ASTM A312 / A312M STAINLESS STEEL SEAMLESS TUBE 304L GR. ASTM A312 / A312M STAINLESS STEEL ERW TUBE 304L GR. ASTM A312 / A312M STAINLESS STEEL TUBE 304H GR. ASTM A312 / A312M STAINLESS STEEL SEAMLESS TUBE 304H GR. ASTM A312 / A312M STAINLESS STEEL ERW TUBE 304H GR. ASTM A312 / A312M STAINLESS STEEL TUBE 316 GR. ASTM A312 / A312M STAINLESS STEEL SEAMLESS TUBE 316 GR. ASTM A312 / A312M STAINLESS STEEL ERW TUBE 316 GR. ASTM A312 / A312M STAINLESS STEEL TUBE 316L GR. ASTM A312 / A312M STAINLESS STEEL SEAMLESS TUBE 316L GR. ASTM A312 / A312M STAINLESS STEEL ERW TUBE 316L GR. ASTM A312 / A312M STAINLESS STEEL TUBE 904L GR. ASTM A312 / A312M STAINLESS STEEL SEAMLESS TUBE 904L GR. ASTM A312 / A312M STAINLESS STEEL ERW TUBE 904L GR. ASTM A312 / A312M STAINLESS STEEL TUBE 310 GR. ASTM A312 / A312M STAINLESS STEEL SEAMLESS TUBE 310 GR. ASTM A312 / A312M STAINLESS STEEL ERW TUBE 310 GR. ASTM A312 / A312M STAINLESS STEEL TUBE 321 GR. ASTM A312 / A312M STAINLESS STEEL SEAMLESS TUBE 321 GR. ASTM A312 / A312M STAINLESS STEEL ERW TUBE 321 GR. ASTM A312 / A312M STAINLESS STEEL TUBE 347 GR. ASTM A312 / A312M STAINLESS STEEL SEAMLESS TUBE 347 GR. ASTM A312 / A312M STAINLESS STEEL ERW PIPE TUBE 347GR. ASTM A312 / A312M STAINLESS STEEL TUBE 347H GR. ASTM A312 / A312M STAINLESS STEEL SEAMLESS TUBE 347H GR. ASTM A312 / A312M STAINLESS STEEL ERW TUBE 347H GR.